Peggy, who is from Charleston, South Carolina, is the master of all shrimp dishes. She introduced me to this dish, which I instantly added to my repertoire. I think you will too. These are delicious. Shell the shrimp. I never remove the vein but prefer to leave the shrimp whole, but you can certainly devein them if you prefer. Put the shrimp in a bowl, and add as much oil and as many breadcrumbs as you need to to coat the shrimp lightly but evenly all over. Marcella specifies that you use olive oil and vegetable oil in equal parts; and you might want to try that because she probably has a reason. However, sometimes I only use olive oil and just glug it in until it feels right - enough so when you add the breadcrumbs, they coat the shrimp evenly. Add the chopped garlic, parsley, salt, and pepper. Toss thoroughly to coat the shrimp well. It's best if you let them to steep in their coating for 20 to 30 minutes at room temperature, but I have cooked them right away with good results. Don't be tempted to add lemon juice to the marinade; it will start to cook the shrimp. I cook these on a preheated electric grill that is part of my stove. If you are going to cook them over charcoal, light the charcoal in time for it to form white ash before cooking. If you are going to cook them on a gas grill, preheat it first. Skewer the shrimp tightly, curling one end of each shrimp inward so that the skewer goes through the shrimp in three places. 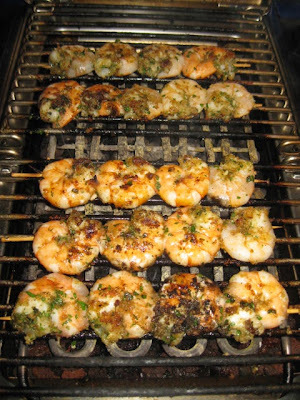 This prevents the shrimp from spinning around as you turn the skewer over. Cook the shrimp close to the source of heat until they have a thin, golden crust. I cook these longer than you might think - usually for a total of 7 minutes. Even though I don't like my shrimp overcooked - who does? - I have found that undercooking these takes away from the flavor. Serve piping hot, optionally with lemon wedges. Awesome recipe. Best tasting shrimp!